I cringe at the thought of being called religious. Why? Because of all that word has come to represent. 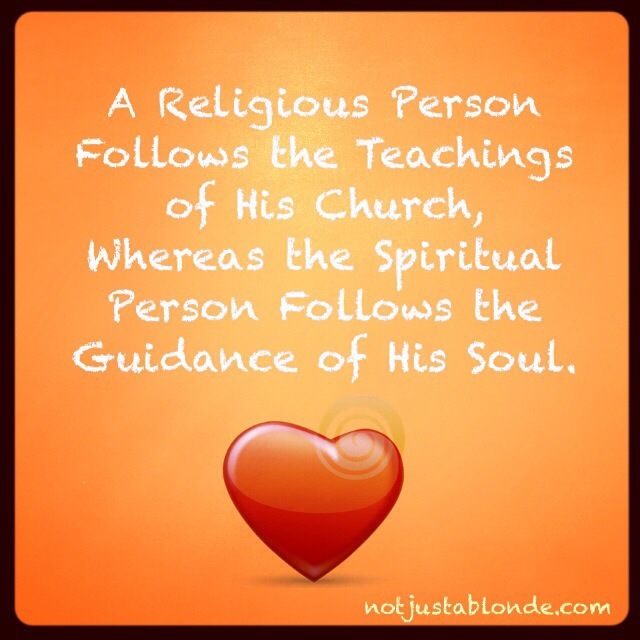 The word religious describes so many who have used their spiritual beliefs to separate themselves from others. These folks use religion as an excuse to justify their judgement and hate against their neighbors. Sometimes these folks are the most hateful towards their own siblings of faith! Instead, I see myself as spiritual… free to evolve my beliefs as led by God not by man. Do I attend Church? Sure! And truly love it! Yet, I don’t believe any denomination has this whole God-thing 100% right. I go to church to be God-inspired. I go to unite with others to do GOOD things with God. I go to church to learn, but not by sitting in a pew and passively being fed but by actively listening and weighing what I hear with the God-spark in my soul. No, I am not religious. I am not willing to constrain myself to set beliefs or define myself by another’s understanding. I want to be free to grow as God directs me and follow the spiritual path as He leads my way. Ann, I very much agree with you. It seems to me that religions are created by man for the benefit of man and that the Bible was written by men for their own purposes, although I can concede that they thought what they were doing was for the best. We can see that the many denominations have been created as a result of different beliefs that have resulted mainly from the errors, inconsistencies and contradictions in the Bible. Have never seen that quote, love it, thank you!! !